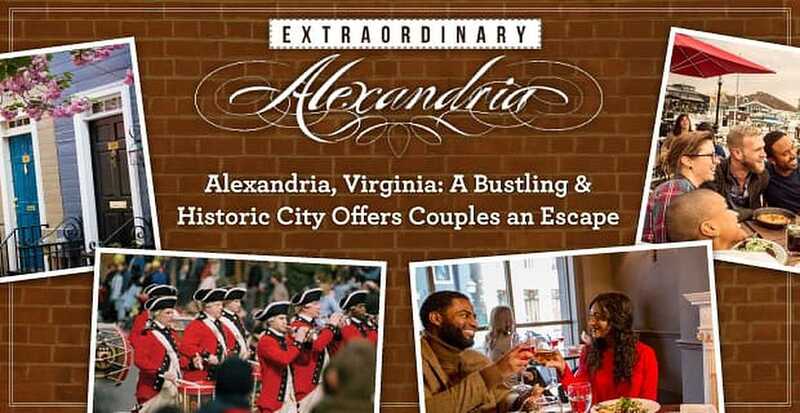 The Short Version: The vibrant city of Alexandria, Virginia, provides a romantic setting for couples going on a date, honeymoon, or vacation. From elegant restaurants to trendy street vendors, the local flavor entices residents and visitors to savor those special moments with their loved ones. You can walk down King Street in the heart of Old Town to discover lovely boutique spots that make great date venues. Founded in 1749, Alexandria’s historic district transports visitors back in time with educational tours steeped in American history and tradition. Whether you’re interested in exploring museums, sampling signature dishes, or kayaking down the Potomac River, Alexandria offers an immersive and relaxing getaway less than 10 miles from the nation’s capital. When Angie Caro and Chris Walker got married, they didn’t want the ceremony to be a big formal event — they just wanted to celebrate with family and friends. So they chose to have an outdoor wedding in Alexandria, Virginia. The beautiful greenery of the Carlyle House Historic Park provided the perfect backdrop for their special day. Alexandria, Virginia, entertains visitors and residents with its historic sites and cultural events. Photo credit: K Summerer for Visit Alexandria. Of course, you don’t have to tie the knot to have a romantic evening in Alexandria. In 2017, Amazon named Alexandria the third most romantic city in the US, and, when strolling down the cobblestone streets of Old Town or picnicking alongside the Potomac River, it’s easy to see why. If you’re looking for unforgettable date ideas in Alexandria, our dating experts have got you covered. 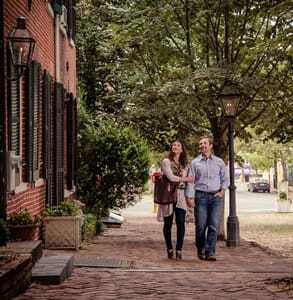 We’ve highlighted some of our favorite date-worthy activities in the city, but you can also search online for romantic inspiration by checking date ideas on the city’s official website or using the #ExtraordinaryALX to find out what goings-on have locals talking. 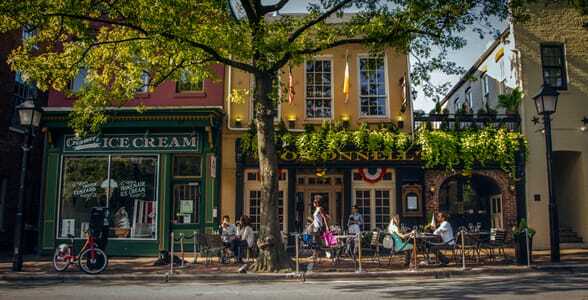 Old Town Alexandria is a bustling district that traces its history back to 1749, but don’t let its ancient roots fool you. The city is a thriving and trendy place to take a date. Smarter Travel even named it in its 2017 list of must-visit US hot spots. 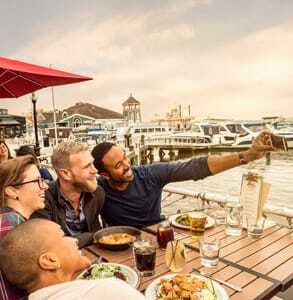 In fact, Old Town Alexandria has over 200 independent restaurants and boutiques to satisfy couples seeking a romantic place to unwind together. Couples can enjoy a special dinner at Vermilion (where the Obamas once celebrated Valentine’s Day) or share signature drinks at Bar PX (a speakeasy-style lounge on King Street). Some of the beautiful architecture in this area has been around since the days of George Washington. King Street is packed with fun date destinations for couples of all ages. Photo Credit: K Summerer for Visit Alexandria. Street food has become increasingly popular in Alexandria. As you walk from boutique stores to historic sites, you can grab a bite from one of the city’s famed street vendors, including Smoking Kow BBQ, aka DC’s first American BBQ taco food truck. The signature dish for this trendy eatery is the Mac ‘N Meat — a gooey combination of mac ‘n’ cheese and barbecued meats. In 2018, Smoking Kow BBQ plans to open a brick-and-mortar location to further satisfy singles, families, and couples craving an indulgent meal. Alexandria isn’t all eateries and bars. It also has many historic sites, public parks, and natural areas to engage folks on an afternoon under the sun. Outdoorsy couples can rent bicycles and explore the bike trails throughout the city. A leisurely ride from Old Town to Jones Point Park or George Washington’s Mount Vernon can help couples take in the scenery and enjoy their day together. The Mount Vernon Trail takes a scenic route 18 miles along the Potomac River, offering bikers breathtaking views of the DC skyline. You can also rent stand-up paddleboards or kayaks with your loved one and get a close-up look at the Potomac River. If you’d rather go along for the ride than strike out on your own, you can book a boat cruise to Mount Vernon or DC. Alexandria’s waterfront activities provide wonderful daytime diversions. 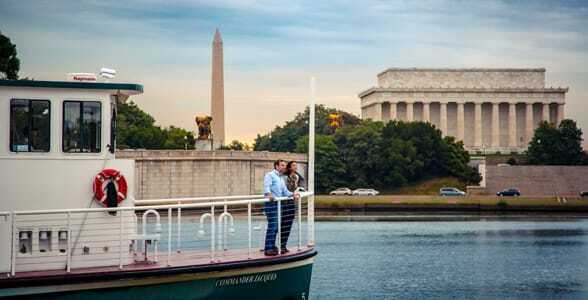 When the weather is nice, couples can take a scenic boat tour from Alexandria to Washington, DC. Photo credit: K Summerer for Visit Alexandria. Alexandria hosts special events and festivals all year round. If you’re visiting in December, you’ll definitely want to put the Scottish Christmas Walk Parade or the Holiday Boat Parade of Lights on your calendar. These events feature many beautiful sights in the city’s streets and waterways. Budget-conscious visitors should consider booking their stay during January or August when the city typically offers the lowest hotel rates of the year. The streets will be less crowded during these off-peak seasons, but you can always find a historical tour, music festival, theater performance, or cultural event by referencing the Visit Alexandria calendar. Plus, the city’s bars and pubs host live performances throughout the year, so you can always take a walk through Old Town and follow the sounds of music to a good time. Although the city itself is centuries old, Alexandria never stops growing and providing new experiences to visitors and residents. Whether it’s a restaurant opening or a theatrical performance, there’s always something new to see here. In 2018, Alexandria will expand its waterfront destinations and attractions. Photo credit: Todd Wright for VTC. In the fall of 2018, Alexandria will unveil a new public plaza on King Street. The same designers who dreamed up Bryant Park in New York City, imagined this public space as a way to host more pop-up markets, festivals, and live music in the historic hub of the city. Additionally, the Potomac Riverboat Company, which is based in Alexandria, will be expanding its water taxi service this year to include a high-speed, low-wake service to the Wharf, a cutting-edge riverfront development southwest of DC. Visitors can also look forward to new historic tours taking place throughout Alexandria, including on the Potomac River. In the summer, Gadsby’s Tavern Museum plans to run a Hamilton-themed tour to celebrate the Broadway hit’s run at the Kennedy Center. The tour will delve into the politics of Hamilton’s day, adding context to the musical many locals have come to know and love. If you want to make your stay truly special and indulgent, you can stay at the Kimpton Lorien Hotel & Spa and get a luxurious massage or facial at the Lorien Spa. This elegant hotel has 107 guest rooms, including 16 suites, and will complete a multimillion-dollar redesign in spring 2018 to make its space even more welcoming, contemporary, and refined. Angie and Chris chose Alexandria as their wedding destination because its beauty, affordability, and inclusiveness provided the low-key yet romantic atmosphere they desired. From the restaurants in Old Town to the bike trails along the Potomac River, Alexandria offers couples many opportunities to enjoy themselves and bond in a quaint, historic setting. If you’re looking for a memorable date activity, you won’t have to look far in this youthful and cosmopolitan city. Leah said Alexandria has won many accolades over the years because it’s a place like no other. “Alexandria is recognized as a welcoming city and a respite from the hustle and bustle of Washington, DC,” she said.